General Description of CD61 / Integrin beta-3. Reacts with human integrin beta3 (GPIIIa, vitronectin receptor beta chain). It associates with the ?V-chain (CD51) to form vitronectin receptor, or with the ?IIb-chain (CD41) to form the GpIIb/GpIIIa complex (CD41/CD61). The CD41/CD61 complex appears early in megakaryocyte maturation. The activated CD41/CD61 complex is a receptor for von Willebrand factor, soluble fibrinogen, fibronectin, vitronectin and thrombospondin. It plays a central role in platelet activation and aggregation. 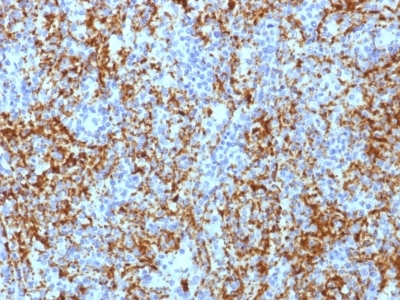 The CD51/CD61 is implicated in tumor metastasis and adenoviral infection. The antibody detects platelets in smears of blood and bone marrow, as well as megakaryocytes in frozen sections and cell smears. The antibody is useful for classification of megakaryoblastic leukemia. 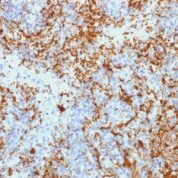 Variations in CD61 / Integrin beta-3 antibody staining intensity in immunohistochemistry on tissue sections are present across different anatomical locations. An intense signal was observed in hematopoietic cells in the bone marrow. More moderate antibody staining intensity was present in hematopoietic cells in the bone marrow. Low, but measureable presence of CD61 / Integrin beta-3 could be seen in. We were unable to detect CD61 / Integrin beta-3 in other tissues. Disease states, inflammation, and other physiological changes can have a substantial impact on antibody staining patterns. These measurements were all taken in tissues deemed normal or from patients without known disease. enQuire Bio's CD61 / Integrin beta-3 Anti-Human Monoclonal is available for Research Use Only. This antibody is guaranteed to work for a period of two years when properly stored.